All of our suites have King Sleep Number beds, luxurious linens and towels, and comfortably furnished, non-smoking rooms. All suites have air-conditioning and heating. No suites have refrigerators or cooking supplies. Food and drinks are available on-site by request, and guests may use the dining room refrigerator to cool a few personal items. As a sanctuary retreat, TV's and clocks are NOT supplied, in order to support a relaxing and calming environment where guests can reconnect with themselves, loved ones and nature. Sky Loft Suite One bedroom, living area w/ Sleep Number day bed, large bathtub w/ overhead skylight, accommodates 1-3 people. 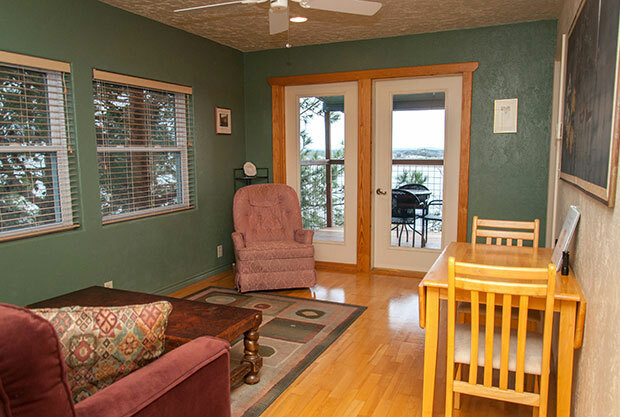 Spacious, w/ spectacular lake views. Pet friendly. Blue Heron Suite One bedroom, living area w/ Sleep Number day bed, small bathtub, accommodates 1-3 people. Covered porch, lake views and breezes. Ground floor, great for guests w/ limited mobility. Pet friendly. Garden Cottage One bedroom, sitting area and porch w/ lake and garden views, small shower, accommodates 1-2 people. Good for guests w/ limited mobility. Pet friendly. 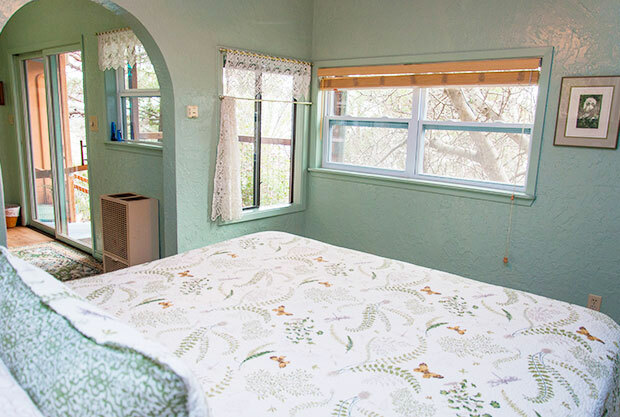 Sunset Guest House Two bedrooms, one w/ King & one w/ 2 Sleep Number long twin beds, both bedrooms have vanity & sink, queen hide-a-bed couch in living room, large shower, separate toilet room, accommodates 1-5 persons. Covered porch w/ sunset views over the lake. Pet friendly. Tree House Yurt One spacious 20' living area w/ King Sleep Number bed, queen futon couch and double futon couch, accommodates 1-5 persons. Spectacular bath house w/ huge tub & rain shower. Pet friendly. We accept cash, checks and Visa, MasterCard, American Express and Discover credit cards for payment. First night's room rate will be charged at the time of booking. If cancellation is made at least 7 days prior to arrival date, a full refund minus a $35 processing fee will be applied. If cancellation is made less than 7 days before arrival, you will forfeit your entire deposit. Pets are welcome in the Garden Cottage, Sunset Guest House and Tree House Yurt. $10/day/pet. Owners are liable for damage! NO SMOKING INSIDE ROOMS. 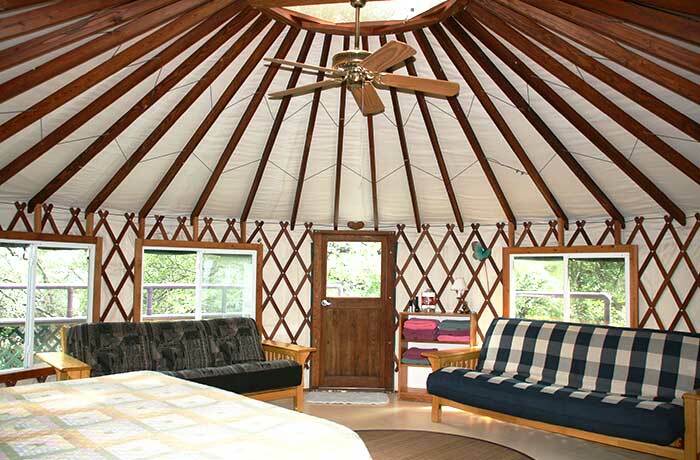 Decks on Sunset Guest House & Tree House Yurt allow people to smoke without violating air space for others. No smoking out on the land due to extreme fire danger. Alcoholic beverages welcome in moderate amounts. [This is NOT the place to be unsteady on your feet!] You can use the dining room refrigerator for cooling needs. Check-in is 3:00 pm - 8:00 pm. Earlier and later check-in must be pre-arranged.